Read the full review at Philosophy Now. As all observers of a particular galaxy far, far away know, there has recently been another awakening in the Force: Star Wars: The Last Jedi. We reviewed Star Wars: The Force Awakens in Issue 115 of Philosophy Now. Our review of that film concentrated on the themes of disenchantment and ‘doubles’ – in particular, pointing out similarities with the original trilogy. 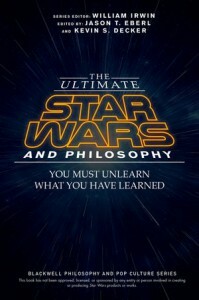 We quoted Bryan Seitz of Babson College as saying, “Philosophy finds power and security in the double but from it simultaneously inherits countless forms of dependence and instability.” The Last Jedi promises that the Star Wars franchise, and perhaps philosophy as well, is capable of transforming dependence and instability to yield something genuinely new. The original Star Wars trilogy unfolded as a classic morality play of good versus evil, with a redemption story at its heart: in a crucial moment, Darth Vader turns from the Dark Side of the Force to save his son, Luke Skywalker. The prequel trilogy affirmed this dualist vision by depicting Anakin Skywalker in another crucial moment of decision: whether to save evil Chancellor Palpatine, who intimates that he holds the secret to saving Anakin’s wife from certain death, or to stand with Jedi Master Mace Windu in preserving freedom and democracy from the tyrannous Sith. He chooses the former, so becoming Darth Vader. Rey © Lucasfilm Ltd. & TM. All rights reserved. Good Or Evil, Or Something Beyond? The Last Jedi continues to use the language of the ‘Light Side’, the ‘Dark Side’, and ‘turning’ from one to the other. Early in the film, after finding him in “the most unfindable place in the galaxy”, Rey tells Luke that the Resistance needs him to return because “Kylo Ren [Vader’s grandson] is strong with the Dark Side of the Force.” Daisy Ridley’s deadpan delivery of this line is perfect insofar as she seems to be reciting from some gnostic textbook about the battle of good versus evil. Luke, however, has grown in wisdom beyond these simplistic categories to know that it is vanity to believe that the Force essentially belongs to the Jedi. He cynically but correctly points out that the Sith, and many others, are aware of, and capable of manipulating, the same Force. In Beyond Good and Evil (1886), Friedrich Nietzsche similarly argued that there is a fundamental ‘will to power’ which simultaneously undergirds and transcends the socially-constructed categories of ‘good’ and ‘evil’, and that the perpetuation of these moral categories serves to fuel the conflict between distinct social forces which are attempting to exert power over each other. In Revenge of the Sith (2005), Emperor Palpatine expressed this same idea by saying that both the Sith and the Jedi crave power and fear to lose it, indicating that this is the real root of their conflict (see Don Adams, ‘Anakin and Achilles: The Scars of Nihilism’ in The Ultimate Star Wars and Philosophy, eds. Eberl and Decker, 2015). Nietzsche’s insight might have served the new trilogy well by providing a novel way of understanding the two moral categories. Alas, writer/director Rian Johnson pulled back, reducing Rey and Kylo Ren’s troubled relationship to a mere tug of war: who’s going to turn which way – towards the light, or towards the dark? Anakin’s own turn to the Dark Side and into Darth Vader could also be examined in terms of the theology of Saint Augustine, as an evil resulting from ‘inordinate desire for temporal goods’ (see Jason T. Eberl, ‘“Know the Dark Side”: A Theodicy of the Force’, in The Ultimate Star Wars and Philosophy). While it isn’t intrinsically wrong, according to Augustine, for a man to love his wife, as Anakin loved Padmé, such love for an ultimately perishable person must be weighed against more eternal goods such as justice. In an Augustinian framework, Anakin’s downfall is due to his privileging his attachment to a mortal human being over the more fundamental good of justice in the galaxy. If Augustine was right that we are fundamentally motivated by what we perceive as good for us, then perhaps we should ask what good(s) Rey and Kylo Ren are pursuing as they turn this way and that. Rey – as Kylo points out – seeks belonging; she seeks relationship with those from whom she expects unconditional love: her parents or some suitable surrogate. However, her experience in the cave on Ahch-To reveals to her that she can only count on herself for self-affirmation. This echoes Ayn Rand’s objectivist view that people will only progress if each individual pursues their own rationally-chosen self-interest; or in other words, that each of us has the potential to flourish by our own devices (see for instance, The Virtue of Selfishness, 1961). This thesis may be contrasted with the communitarian ethos exemplified by neo-Aristotelians such as Alasdair MacIntyre and Martha Nussbaum. Both of these thinkers contend that individual human flourishing – the actualization of each person’s natural capabilities – can only be brought about within a supportive social environment, with institutions (such as the Jedi Order) enshrining practices (the training the Jedi receive) that yield goods internal to such practices (that is, Jedi virtues). So, despite her experience on Ahch-To, The Last Jedi ends with Rey on the Millennium Falcon with General Leia Organa and a severely downsized Resistance clinging to the hope that they “have all that they need” to defeat the First Order – namely, each other. By contrast, in his final shot, Kylo Ren is noticeably alone. The apparition of the last link to his father Han Solo – a pair of dice – disappears in his hand as he watches Rey close the door to the Falcon. He wanted to ‘kill the past’, and he got exactly what he wished for. Read the rest of this review at Philosophy Now.